Bold Type Books, 9781568586793, 256pp. For decades the liberal class was a defense against the worst excesses of power. But the pillars of the liberal class the press, universities, the labor movement, the Democratic Party, and liberal religious institutionshave collapsed. In its absence, the poor, the working class, and even the middle class no longer have a champion. In this searing polemic Chris Hedges indicts liberal institutions, including his former employer, the New York Times, who have distorted their basic beliefs in order to support unfettered capitalism, the national security state, globalization, and staggering income inequalities. 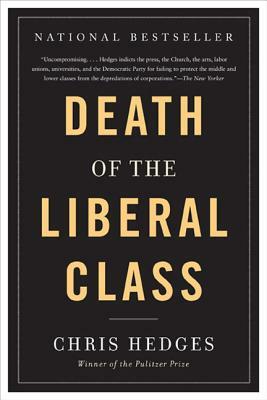 Hedges argues that the death of the liberal class created a profound vacuum at the heart of American political life. And now speculators, war profiteers, and demagogues from militias to the Tea Partyare filling the void. Chris Hedges is a Pulitzer Prizewinning journalist. He spent nearly two decades as a correspondent in Central America, the Middle East, Africa, and the Balkans, with fifteen years at the New York Times. He is the author of numerous bestselling books, including Empire of Illusion; Death of the Liberal Class; War is a Force that Gives Us Meaning; and Days of Destruction, Days of Revolt, which he co-wrote with Joe Sacco. He writes a weekly column for the online magazine Truthdig. He lives in Princeton, New Jersey.